The Auditor’s Office is implementing cost-of-living salary increases for all employees, as approved by the Legislature. Additionally the state Office of Financial Management recommended and approved a 5 percent increase specifically for the state auditor classification. Funding these increases requires an adjustment in the local government hourly billing rate, to $100. The great majority of your audit bill goes straight into local audit teams, with most of that going to salaries and benefits for auditors. We heard from local governments that they value working with experienced auditors. Incremental salary increases in the past few years have helped retain those experienced auditors. Four years ago, many of the Office’s experienced auditors were leaving for positions in other governments that paid $10,000 a year more. Since then, the turnover rate has fallen by more than 40 percent. To more appropriately manage our costs, the Auditor’s Office moved away from solely increasing the hourly audit billing rate this year. The hourly billing rate for auditors in travel status has been adjusted to 75 percent of the full rate, or $75. When auditors are traveling, the Auditor’s Office still incurs full salary and benefit costs. We believe the 75 percent rate is closer to the Office’s actual operational costs. A new billing rate for fraud work has been set at $125 an hour. Fraud investigations are much more expensive than a typical audit. They involve legal review, for example, and this rate reflects those higher costs. Like each of your governments, the Auditor’s Office must routinely account for increases in costs while providing high-quality, efficient services. We want you and the people in your communities to have confidence in the independent reviews the Office provides. At the Washington Finance Officers Association’s conference in September, you will hear more about the improvements being made to the services you use. 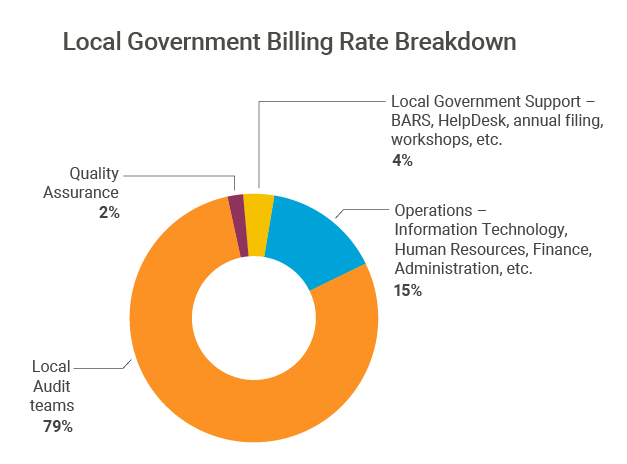 The billing rate adjustments made this year are investments in high-quality services. We will continue to stay in communication with you regarding billing rates and encourage you to contact us if you would like to talk more about audit costs. We value your partnership and investment in good government.